Industrial Printing Press Repair and Printing Press Systems Installation, Printing Press Service, Printing Press Machining, Printing Press Finishing and Moving. We specialize in repairing and servicing Harris printing presses, Goss printing presses and Cottrell printing presses in the USA, Canada and Latin America. 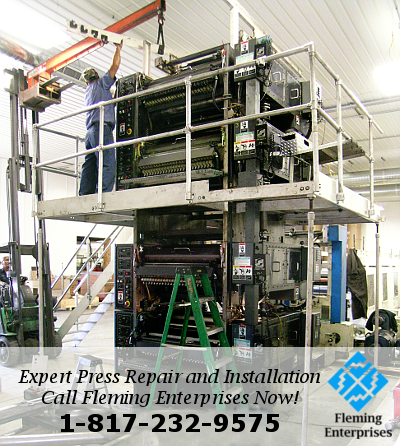 Fleming Enterprises began in 1983 and is now a leader in supplying, repairing, machining and installing a turn key printing system to web offset printing presses tailored to suit any companies needs. We repair your existing equipment. Our company provides these services throughout the United States and Latin America. No job is too big or too small. We install both heatset and coldset printing systems, along with related equipment. Our qualifications include actual press operation experience. Our team are experts in assessing a customers needs, and responding accordingly. In addition, some jobs require incorporating programmable logic controllers, or other control systems. Fleming will provide this as part of the installation or repair package as well. Our experienced personnel have complete diagnostic capabilities to assist raising in-plant production and quality. Fleming Enterprises maintains a twenty-four hour answering service to reduce customer’s production losses. We really care. At Fleming Enterprises, our top priority is serving our customers in the United States and Latin American countries. We provide nine categories of services from turnkey operations to perfect parts. We pride ourselves on being Web Equipment Specialists. Fleming Enterprises quotes competitive prices while providing high quality work. When you need web equipment, installation, breakdown service, parts, or press moving, contact us. We were pressmen before we became field service technicians, so we know how the product should look and perform. Mechanical and electrical precision is the name of our game.